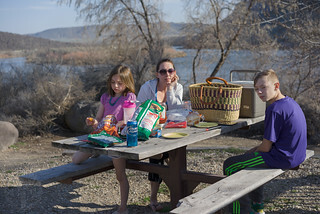 This warm and dry spring inspires a hot dog and marshmallow excursion to the Snake River where kids have played on a curious collection of round boulders for a thousand years. A rare ride with Kayla to Initial Point then Swan Falls Dam and across the desolate Birds of Prey area to Grand View and much needed dinner at the Black Sands Resort along the C.J. Strike Reservoir. We only fall over once. I have noticed Swan Falls dam several times during flight lessons, just minutes from the airport, and have been wanting to drive down to check it out. A sunny spring day seemed a good time to finally explore.